Take a quick look at the car pictured above and your first reaction will probably be ‘what the hell is that?’ It’s a Mazda Miata, but it looks unlike any other Miata out there. 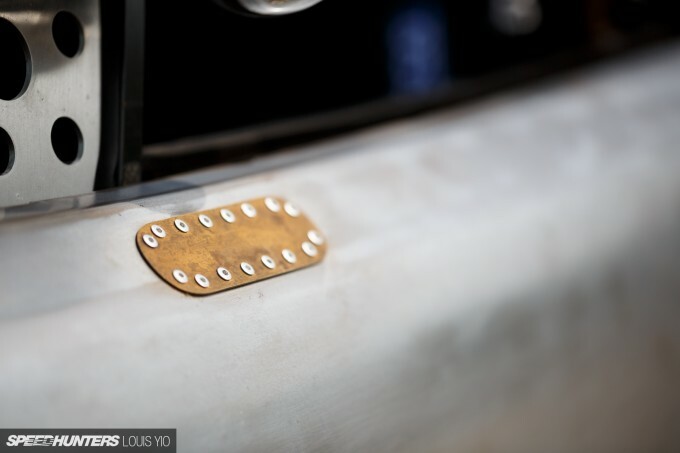 The front panels are completely removed and in their place sits a grille that’s inspired by a ’32 Ford. 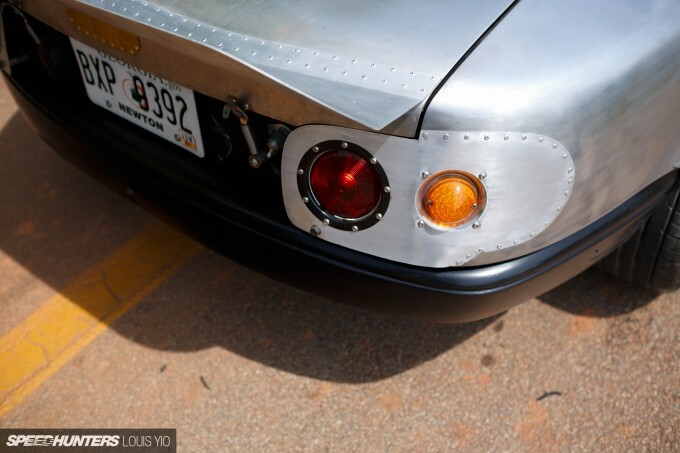 The body is finished in bare metal and nearly every part you see appears to be homemade. You’d be forgiven if you assumed this Mazda to be a bit of a joke – a gimmick on wheels built for Instagram likes and comment thread flame wars. We’ve all seen those guys who say they build a car only for themselves when all they really want to do upset as many people as possible. This isn’t one of those cars. 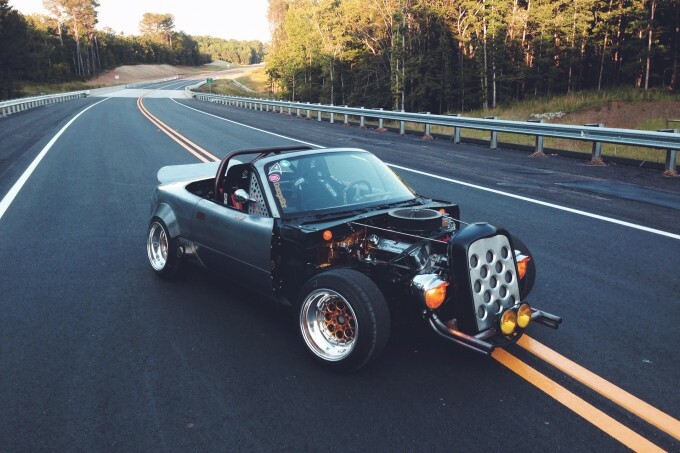 It might look like the kind of car built to turn internet forums upside down, but the truth is, everything on this Miata is there for a reason – much like the hot rods that inspired its look. Like a lot of us, Tommy Reichelderfer grew up around cars and some of his first automotive memories are of his father’s MGB and Triumph TR4. He loved the simplistic purity of those two-seat machines, and the influence of those cars helped shape Tommy’s automotive tastes when he reached driving age. Not surprisingly, he found himself strongly attracted to the Mazda Miata – the modern equivalent of the roadsters from his childhood. Tommy owned several different Miatas in various states of modification before acquiring the car you see here from a friend in 2010. 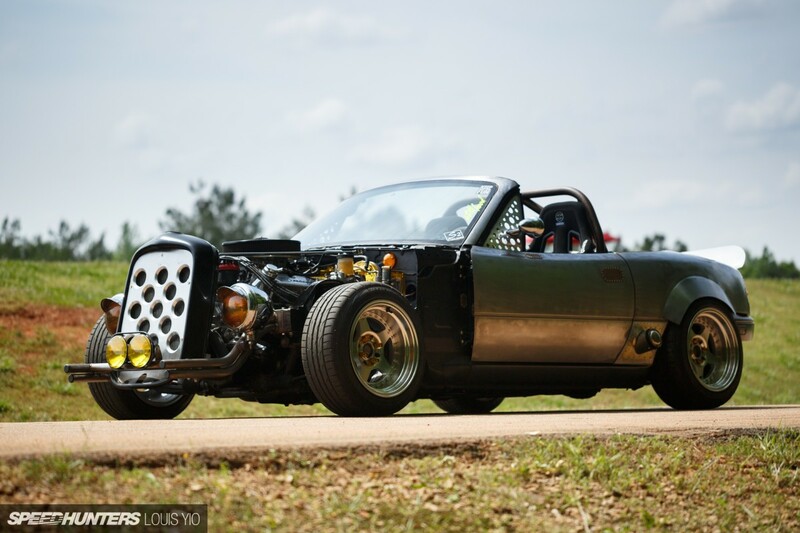 Through his past Miata experiences he learned that he loved trimming weight from wherever possible, and for this project he wanted to take the weight shaving to a new level. 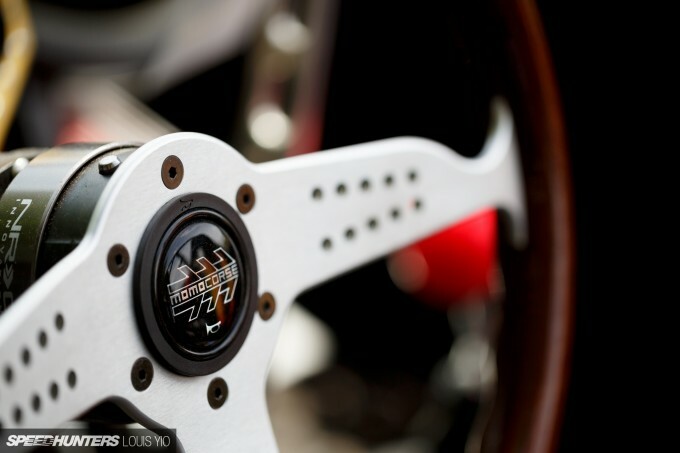 Tommy had also taken quite a liking to drifting thanks to a burgeoning local scene in the Atlanta area, and to make the little Roadster more adept at going sideways he started to entertain the idea of a V8 swap. He’d also taken a job as machinist/engine builder at a shop specializing in American V8s and that enticed him even more. 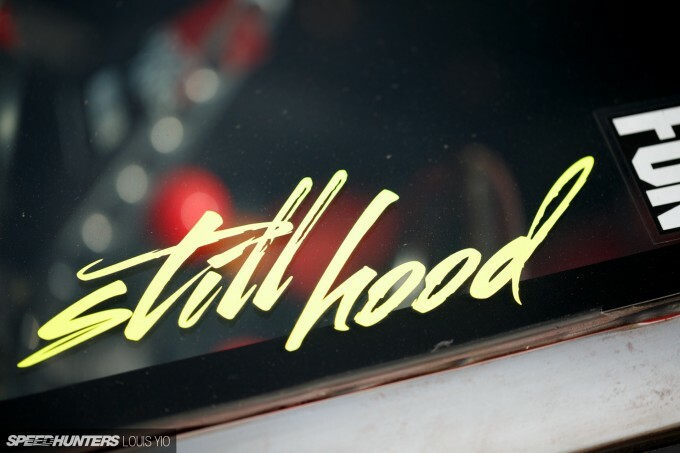 The engine Tommy settled on is a fully rebuilt 1985 Ford 302 small block with AFR aluminum heads, a Comp cam, an Edelbrock intake manifold with a Holley carb and other goodies proven to make small block Fords sing. 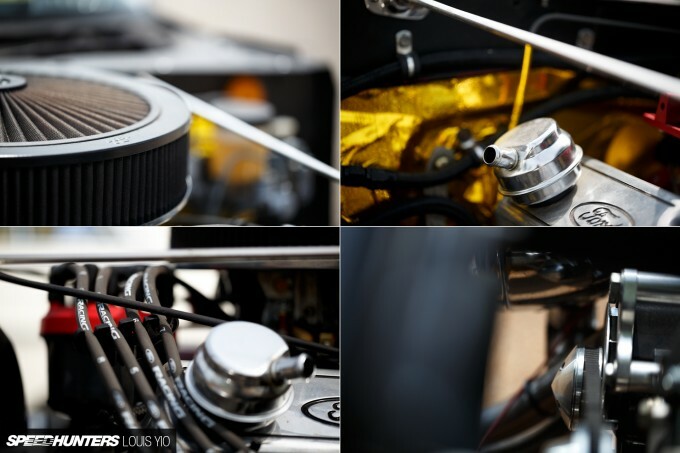 The engine setup is symbolic of the car itself – it’s simple and gets the job done without fuss. 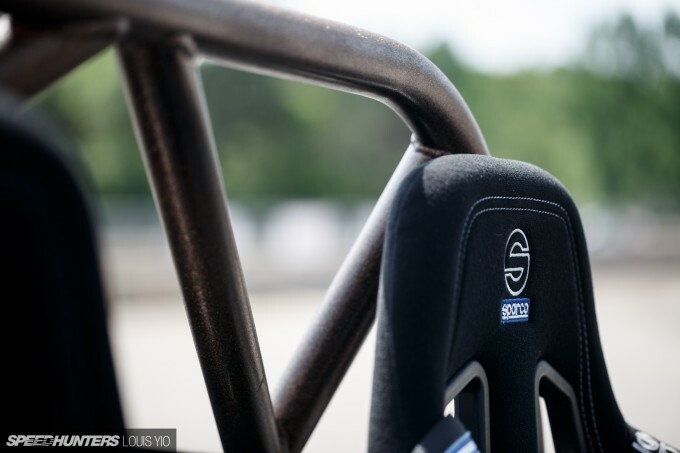 It also makes for a quite pleasing power to weight ratio given the work done to shed pounds from the Miata – but we’ll get to that in a moment. 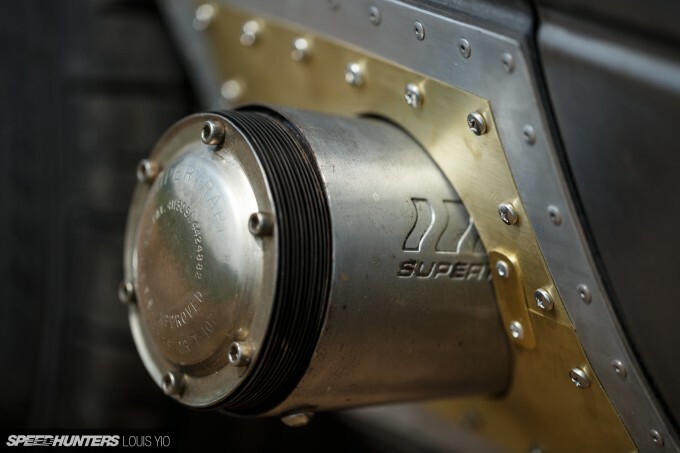 The V8 is matched to a BorgWarner World Class T5 5-speed, and because there was no way the stock rear end was going to handle the 5.0 power Tommy swapped in a 7.5-inch IRS LSD unit from a Ford Thunderbird. As mentioned a moment ago, weight trimming is a key part of the build. And what better way to shed pounds than by removing body panels entirely? Up front the fenders, hood and bumper have all been ditched in the name of weight reduction. In their place is a custom front end that uses a chopped ’32 Ford replica grille frame and United Pacific ’30s Ford replica headlight buckets. 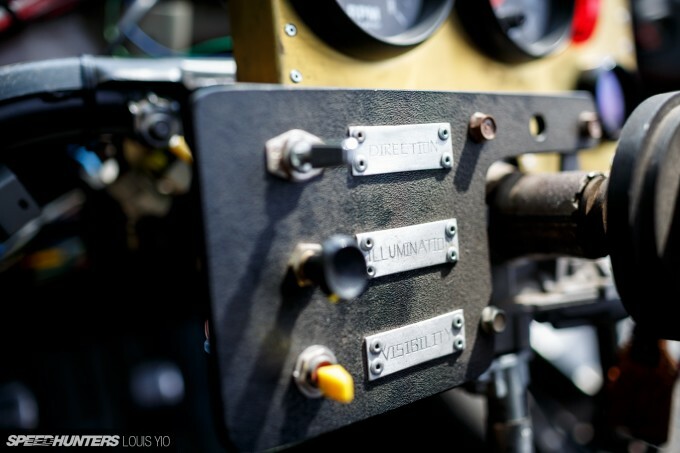 Tommy wasn’t going for a specific theme when he started the build, but the old Ford parts were the perfect way of getting the necessary cooling and lighting components on the front end. 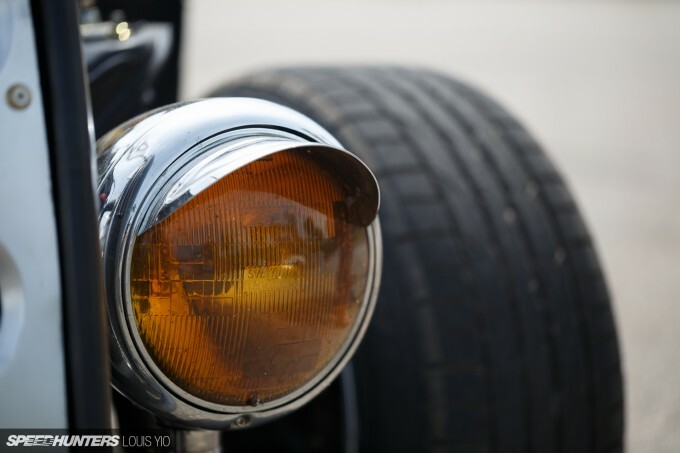 The makeshift front end actually led him to add other hot rod touches to the rest of the car, including the handmade rear fender flares, handmade steel duckbill spoiler and the custom retro-style tail lights. 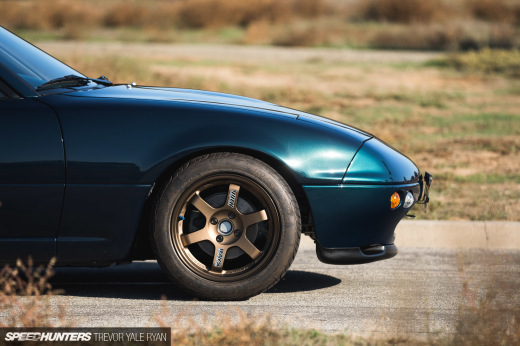 The clever modifications did a lot in trimming weight, and even with the big V8 on board the car weighs just 2,040 lbs – some 200lbs lighter than the stock ’93 Miata that Tommy also owns. And better yet, all the big weight savings happened over the nose, keeping the balance that makes early Miatas so fun to drive in the first place. 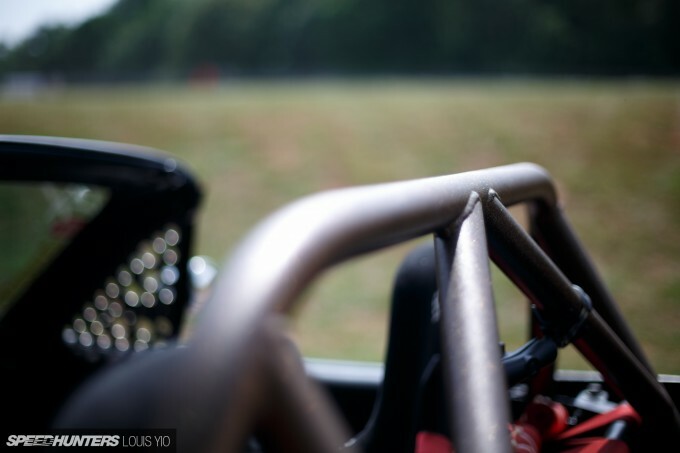 Unfortunately, by the time the car was ready for action in 2013, organized drifting in Atlanta had largely been shut down and Tommy’s only had the chance to run a couple of drift events so far. Even so, he couldn’t be more happy with both the car and the experience he’s gained while building it. 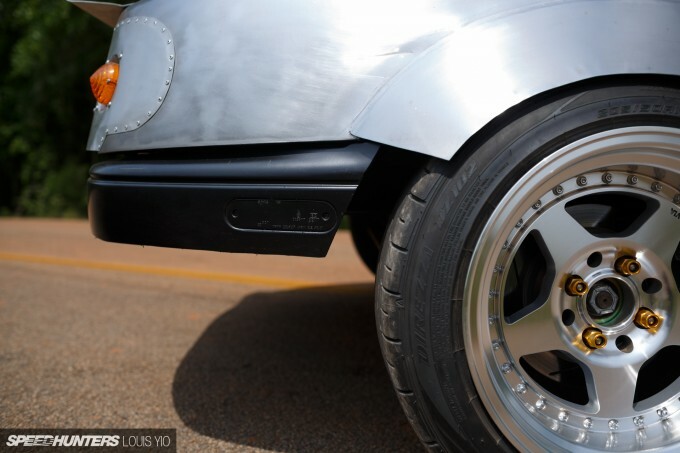 The whole thing was built primarily in his garage and he’s learned a ton during the process – including how to weld. And when he hops in for a drive, he can’t get enough of the raw, fast and fun feel which defines the car. 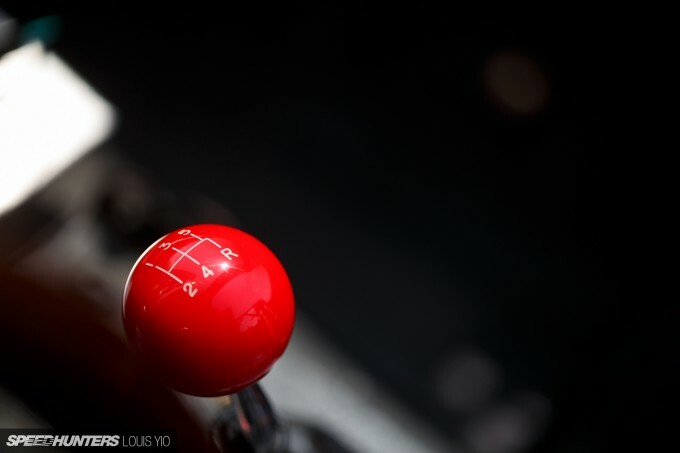 Because Tommy knows the online world is filled with people who might not enjoy his car as much he does, he says he steers clear of internet forums and the negativity that comes with them. And like most hot rods, he says the project will never be finished. 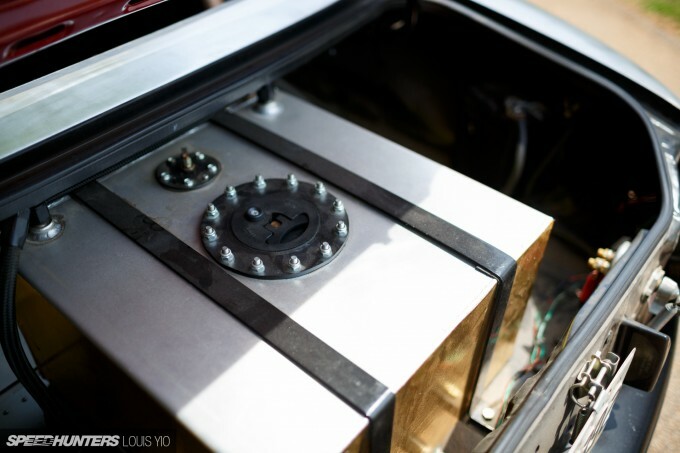 On Tommy’s current plan list is a custom-built fastback roof and an aluminum cowl panel. There’s still much for him to learn when it comes to this car. Despite the strong reactions this zombie Mazda is guaranteed to receive, Tommy never had a goal of building something so wild and unconventional that it sends purists running for the hills. 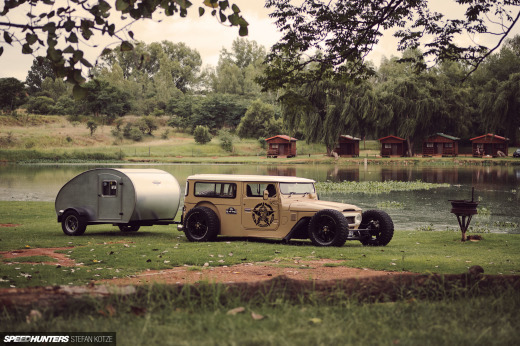 Nope, like a lot of great homemade hot rods, that’s just kind of how it worked out – and for that we absolutely love it. it'd look so much cooler without the faux-Ford grill, just a frame with the lights mounted. I love it, so much fun and creativity. I'm sure it's a blast to drive as well. So any shots of it in action or is this another one of those "I built it for myself but I promoted it on the internet so others can see how radical I am." I drooled over this car for a sold 20 min at FDATL, such a cool and inspiring build! So does he get any issues from the police for being hoodless? I've always found it strange how hotrod guys can run around with their entire engine hanging out without an issues. But take the hood off on your modern car and oh no it's ticket time. Since this car is in between the two I'd love to know. Creative build too thanks for featuring it. Holy supertrapps! I have vivid memories of pointing those out as a kid over over to my dad who no doubt got sick of them. Have not seen many since the mid 90s. Onto the car though, I've loved this since I first saw it (and the hot rod esque one in Japan) and it's cool to see that he built it to drift, had no idea. Awesome arch work on the rears too. Jagdroach It has a lot to do with the state of GA. Cops typically don't hassle you for car parts missing of modifications. Unless you drive like an idiot, then they'll throw the book at you. Handmade custom Fastback??? Please revisit this car later! WOW!!! This is just something else...the level of imagination its nuts!!! And how much hp does it make? Those other "Monster" miatas have just became obsolete.. Sick car! & I also vote for a revisit when the hardtop is attached! 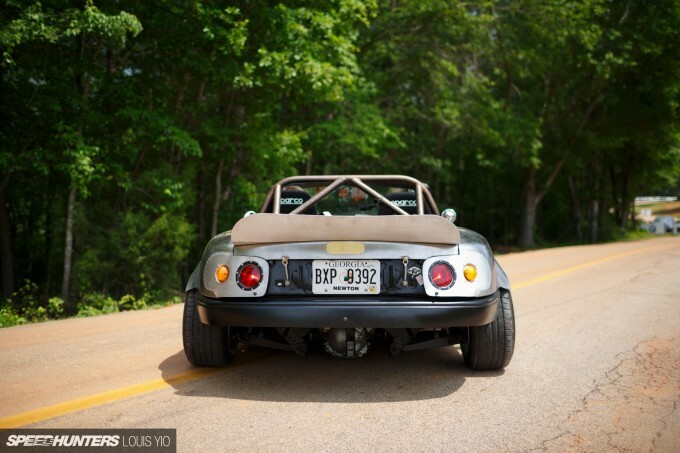 @bnbssll Definitely a unique car, but to say other Monster V8 Miatas are obsolete is laughable. 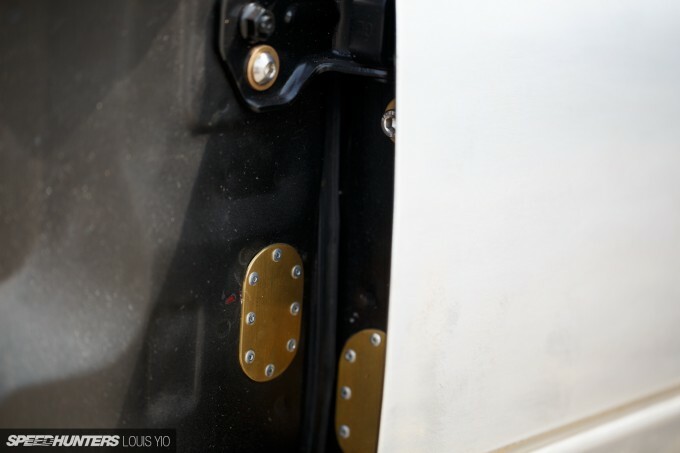 While it was built to drift other Monster Miatas are built for lap times. This car would not clock the same times as a proper MM. Definitely a sick car though! I refer to it as "The Contraption"
If you can build a car like that in Georgia and still have it be street legal, then dammit I'm moving to Georgia! 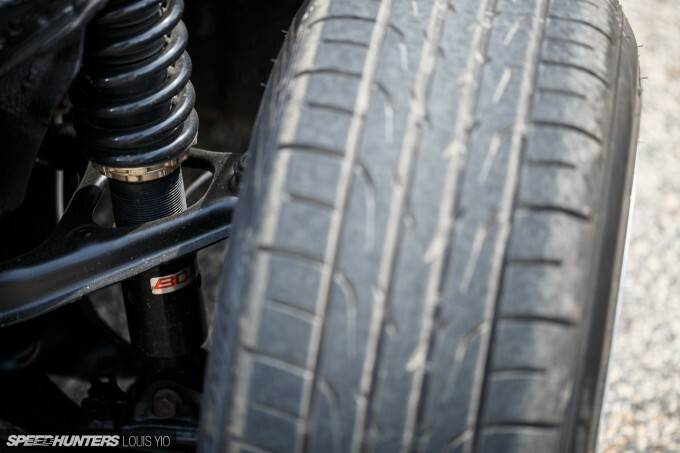 Mike, what are the 5 spoke wheels? Holy smokes, this thing is sweet. 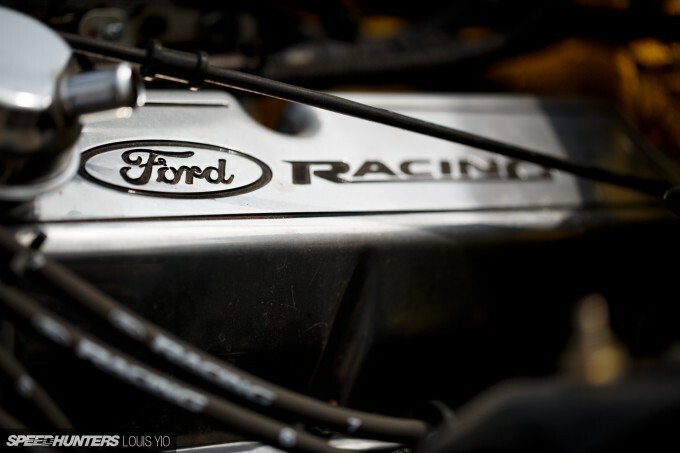 I never realized it had a Ford V8 powerplant from the teaser shots in the past. Love the fact that the inspiration comes from his childhood experiences, you can definitely see the stripped down roadster influences in this one. Must be quite a beast on track! Nah, not for me. I'd want it rotary all the way. Still, an interesting build, and a mean machine, but it's not a rota, so I'd pass. 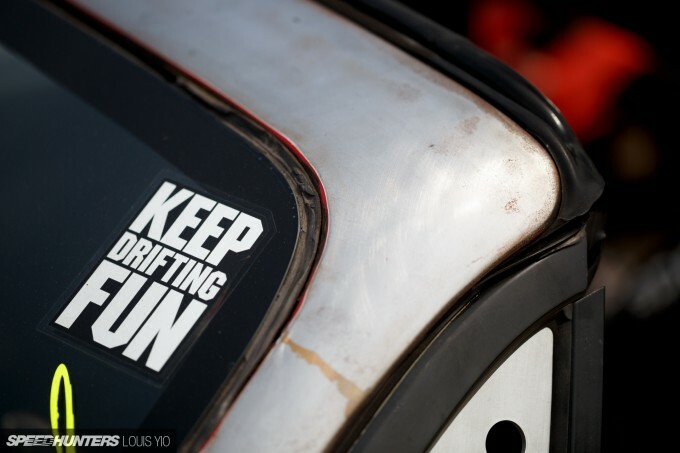 "Keep Drifting Fun" says everything, stop the hate! I love stupid stuff like this. Dare to be different. Awesome. stupid, why waste time on this child's crap? I don't love it, I don't hate it, but I'm glad I got to see and read about it. cutterjones13 Because it is what HE wanted. Obviously to be different and original while also having fun learning new skills. ..buuuut I guess it would be WAAAAY cooler to just throw a set of wheels on a GTR and call it a custom build. BjEnglish Andrew Camps Wow I think thats enough for a miata!...Thanks for the reply! > Says car wasn't built to get attention or be controversial for the sake of being controversial. > Titles article "Screw you Internet." At least there wasn't the "why can't we all just get along, we all love cars so don't say mean things" theme with the article like I was expecting. Couldn't agree more. Creativity is getting harder to come by these days. strut to a double wishbone front-end Integra strut's shaft. piece of metal with a smaller diameter than a SHARPIE PEN! Hellasafe. The best thing about the drift events drying up in Georgia is that he gets to keep his car instead of peeling it off a wall. 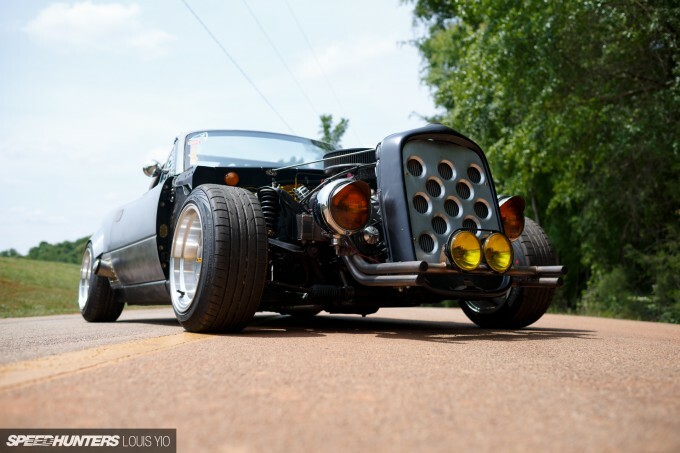 A 1932 Ford is a body on chassis (ladder frame design)...FULL frame front to back! This is a botched unibody. aesthetic purposes while ruining a better design in the process. gonna spend any more time trying to. He and whoever can build what they want. Frankly, I couldn't care less anymore. Creativity is getting harder to come by these days. Forgive my ignorance but can someone explain how the side exit exhaust works? It looks like its plugged up, but I assume the gasses are able to get out somewhere? 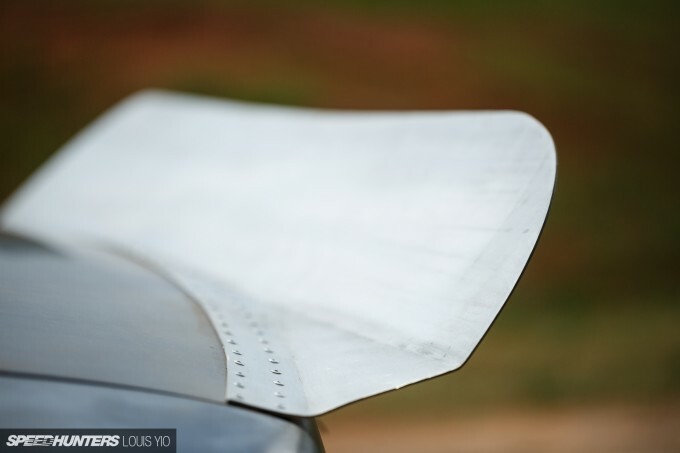 how useful is that duck tail rear deck spoiler is? I guess the article already addresses most of your criticisms; the guy built this car in the way that he wanted, for himself, not as an engineering case study... and if he was going to do it again he'd probably do some things differently - If I was going to build my track car again I'd leave in the heater!! Personally I'm not a fan of the front end, and in my view if you're going to go to this amount of effort, how much more is it to build a few more tubes up front to brace things properly, then throw some stock panels over it all? Oh, and hurrah!! Someone who knows that the phrase is "could NOT care less..."
If the owner gets on this at all there's an event at the beginning of next month at the old watermelon capital track in south Georgia. I'll be running in the tandem group I'd love to chase this thing around. @Elear The closed end portion is just the cap. 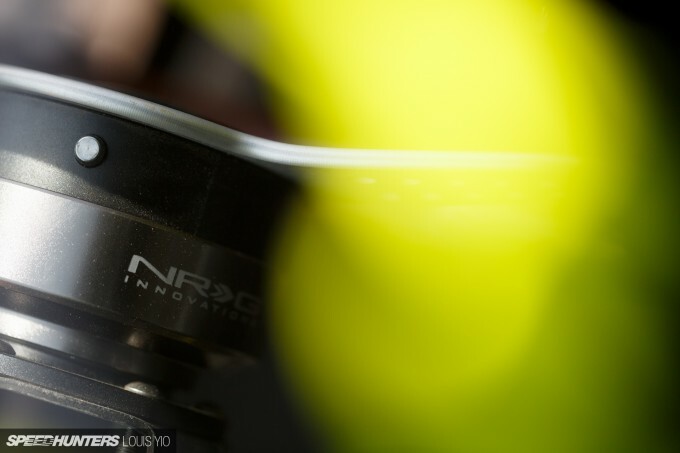 All the disc you see below the cap have an open center section that allows exhaust gasses to flow out to the cap. There is a gap between each disc that allows you to vent the built up pressure inside the chamber created by the discs and cap. The more discs you stack on, the less pressure you will build up in that chamber. This works on the thinking that have a straight through and open exhaust is not always the best option. 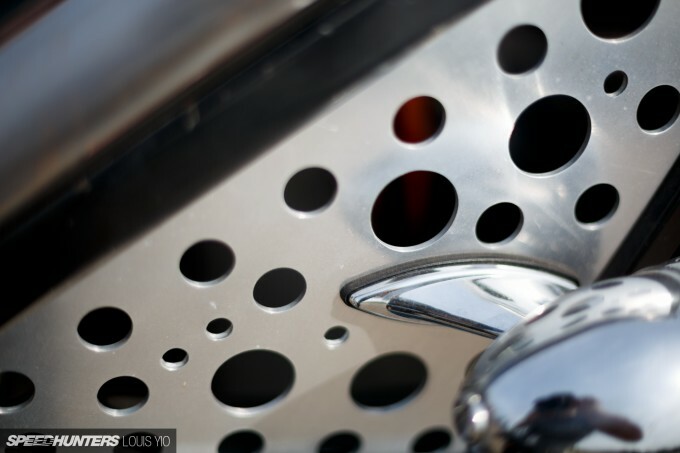 In theory, you can tune the number of discs to get a specific amount of back pressure in the exhaust which will give you the optimum performance. I did it because it looks cool and sounds a little different than your average muffler. It's hideous. I love it. I saw this car at Caffine & Octane a few months back and absolutely love it. Didn't get a good look at it as I was leaving but what a Hell of a build. I've had 4 gen 1 Miatas and my dad has a 91 now and this is just.. Hilarious. Props to him for a badass build! This a great example of "everyone gets a trophy" reporting. He's driven this car at several events. Nice attitude you have there. JonathanW You can say that, but in the article he wants to drift it. Really? With this setup? This was a show car. Even then, a show car with poor taste. Wont run in an import scene, and can't roll it in the Hot Rod scene. Even hot rod guys looking at this would balk. Honestly, looks like someone had fun with sheet stock, tin snips, and a rivet gun. Just a waste. Eye of the beholder, indeed. @KRACKEN Released BjEnglish Andrew Camps 100% on point. @PearlBlueSoul JonathanW Just a waste.. Just like your comment, honestly. Everybody has a different taste. 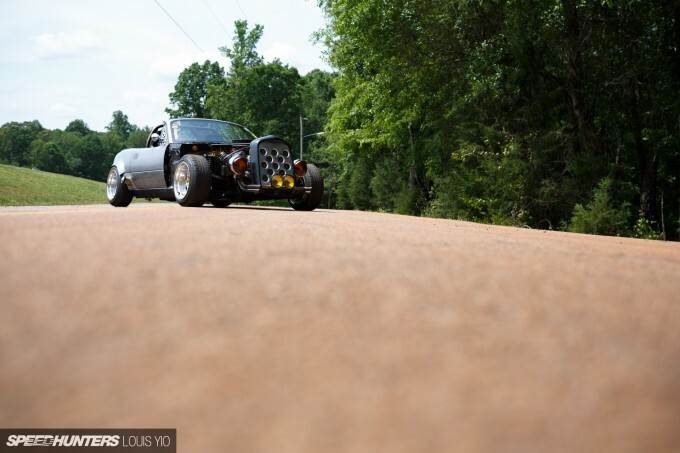 So if he likes a miata with a ford v8 and a hotrod style rad, than why should he not build it? Let;s be honest. We're looking at the most sold roadster in the world. Is it really a waste if you take a few and make them really unique? There are plenty left for purists to make them nice and original, penty for drifters, plenty for the stance people. And if he had fun, than it was all worth it. I love this car said the all stock 93 LE and 96M owner. 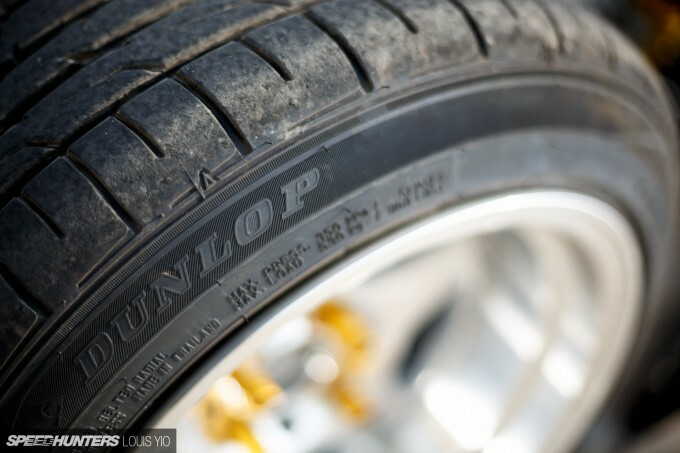 Why don't I modify my cars? Because I don't have the skills but mainly the balls. Why be the same? It always perplexes me why people hate because it is not the same they would build. More power to this builder/owner who built this car the way he wanted and not what was in style at the moment. My claim to being different, I refuse to get a cellphone. Big wow, this build is way better. It's rare that I get involved when the "haters" come out of the woodwork. All I read in your comment was someone beating their chest trying to make themselves look smart at the expense of someone else. The internet seems to give everyone an incredibly false sense of importance. Rather than trashing someone else's years worth of work, why don't you go write a Wikipedia page about "dynamics and chassis construction." If you "frankly couldn't care less" then shuuuuuuut UP! @Mr Mulholland Where's your trophy-winning build?